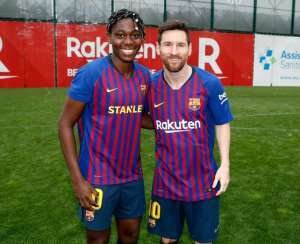 Three-time African footballer of the year, Asisat Oshoala has finally meet her idol, Lionel Messi. The Nigerian superstar who is on loan at the Barcelona female club from her Chinese Female Super League side, posted the photo of the Argentine superstar and herself during their team group photograph after she had previously shared some with other Barcelona male football stars. "Last week, the Nigerian superstar posted a picture of herself and French winger Ousmane Dembele with the caption, "my twin brother." "This week it was the time of five-time Ballon d'Or winner Lionel Messi and guess what the caption was. She tweeted the photo with the caption, "We had to do this for our NAIJA fans." The promising forward is currently on the sideline, and cannot wait to return and continue to bang in goals for her new team, Barcelona.